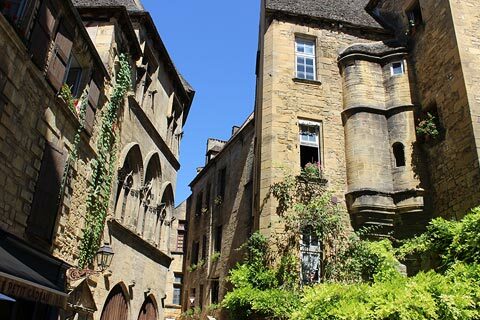 The town of Sarlat is situated in the heart of the Dordogne department, in the region referred to as the 'Perigord Noir'. 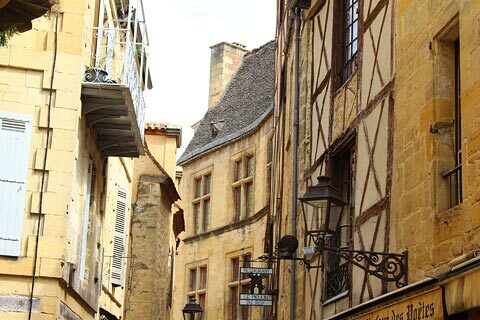 There are more than 250 listed buildings in the old town, typically built in the 15th and 16th centuries: there are more listed buildings per square metre here than any other town in Europe, which explains why the centre of Sarlat is listed as a 'secteur sauvegardé' to restrict future development and the town is also officially listed as a 'Town of Art and History'. 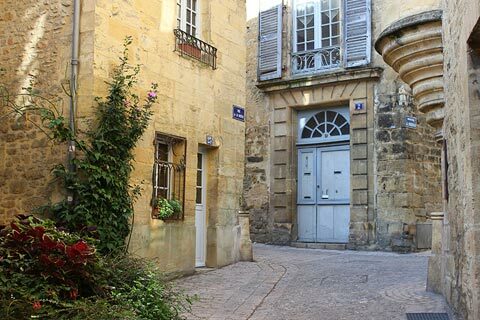 France This Way comment: Sarlat is without a doubt one of the most attractive and most visited medieval towns in France, with the extensive historic centre containing innumerable impressive medieval buildings and monuments. Equally important there are almost no new buildings in the centre to spoil the overall impression that you are in a medieval town. 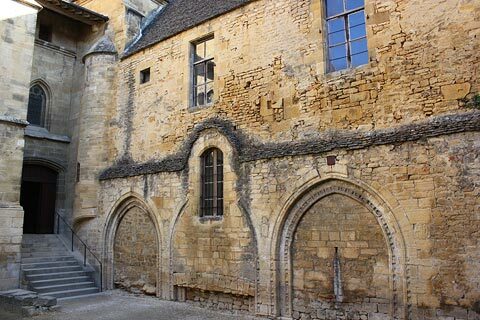 To ensure you make the most of your visit your first stop should be Sarlat Tourist Office on Rue Tourny, near the front of the cathedral, to get a map of the town centre (although the map is rather lacking in detail and information). There is a great deal to discover in Sarlat old town, fine examples of architecture in both medieval and renaissance styles, and a very large number of interesting buildings and architectural details to admire as you do, almost all built in the yellow stone that is characteristic of Dordogne towns and villages, and without a guide map you are likely to overlook some of the highlights. 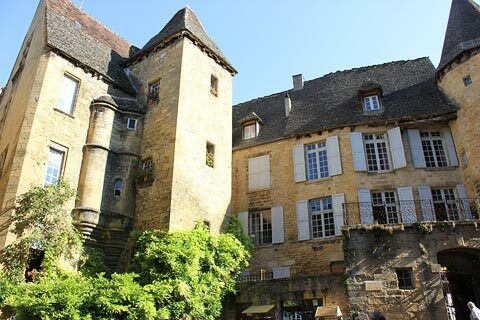 A list of the individual monuments does little to convey the overall impression that Sarlat has on visitor, with every street bringing new surprises, opening into a small square filled with cafes, or revealing another small chapel or tower. Here we mention just a few of the most important sites - be sure to also explore the narrow streets around the cathedral and either side of the Rue de la Republique, the main street through the centre. 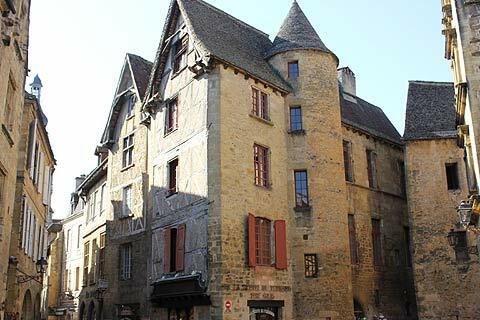 Your visit will usually start in the Place de la Liberté, a good introduction to Sarlat since it includes many fine townhouses that span the period of growth of the town as well as the Town Hall and some attractive medieval arcades. 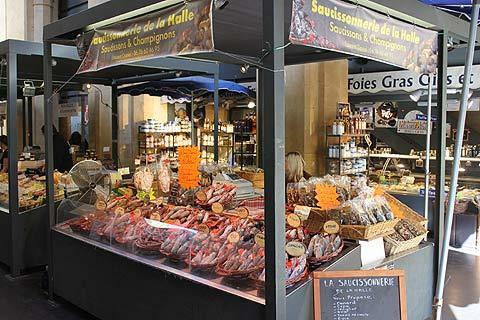 At the northern end of the square follow the street past the small church that has been converted into an indoor market and into the ancient geese market (the Place du Marche aux Oies) and along the rue des Consuls. 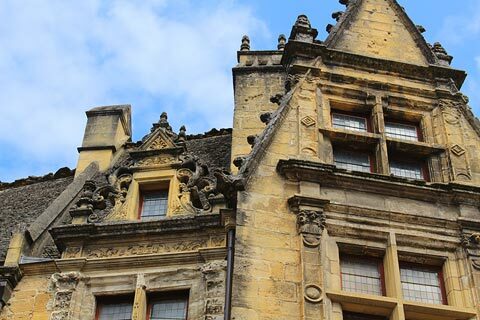 This square and street contain many of the grandest houses in Sarlat, including the Gisson Manor. Situated on the Place du Marche aux Oies the grand 13th century townhouse called the Manoir de Gisson has been fully renovated and furnished, mostly in the 17th century style, and is open to the public (admission around 8 euros), giving an interesting glimpse of what life was like inside these grand houses. Heading south from the Place de la Liberté you reach Place du Peyrou and the cathedral. The Cathedral of Saint-Sacerdos is in the heart of the old town, and falls into three distinct parts. 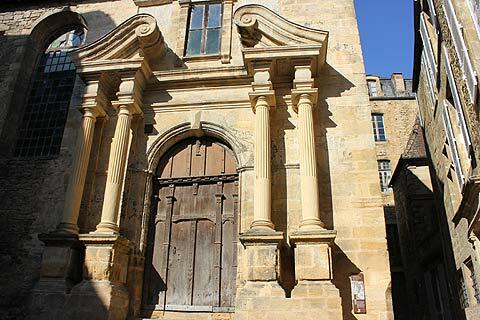 The cathedral entrance is through the roman style belltower that dates back as far as the 12th century; the central nave section is more recent (17th century), and to the rear is the original 14th century cathedral of Saint-Sauveur. Inside the cathedral there are many paintings and statues, and a highly regarded 18th century organ, while just to the rear of the building is a small cemetery. On Place Peyrou in front of the cathedral there are several interesting buildings, including the Hotel de la Boétie - a close friend of Montaigne (the important French philosopher) was born in this ornately decorated house in 1530, and the Hotel de Maleville. 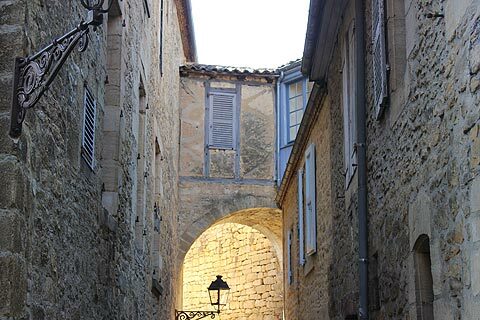 Between the two is the alley called the Passage Henri-de-Ségogne, along which you can see some of the oldest houses in Sarlat. 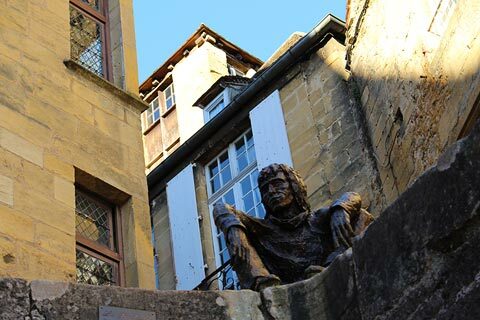 Be sure to also see Sarlat in photos. 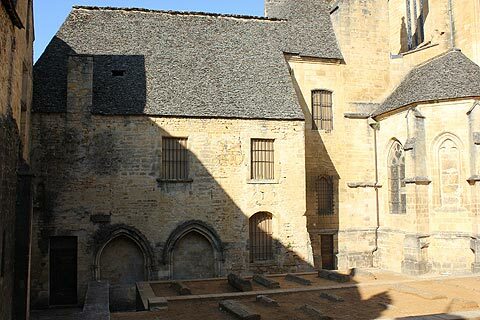 In the 9th century Sarlat developed around a benedictine monastery, and was a wealthy local centre until the Hundred Years War of the 14-15th centuries. After a long period of decline, with outbreaks of plague adding to the problems, the town had a resurgence that carried on into the 16th century and much of the town we see today dates from this period of rebirth. By the 18th century the town was again falling into decline and remained a rather forgotten backwater until the second half of the 20th century - a fate that contributed to the lack of alterations to the town centre. 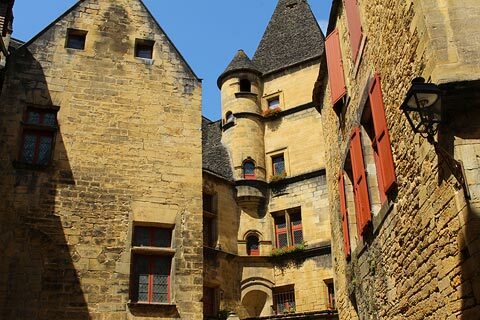 However, in recent decades the important heritage of Sarlat has been recognised and many of the buildings have now been restored to their former glory. As well as the historical sights there are numerous small shops, cafes and restaurants to detain you. 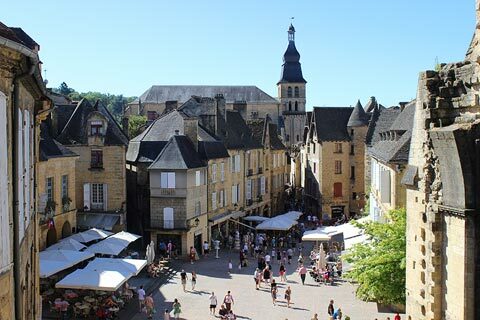 Saturday is market day in Sarlat and a great place to pickup some local products - mushrooms and truffles, foie gras and local fruit, cheese and dried sausages...this is one of the most popular markets in the Dordogne. In the heart of the old town in a converted church the belltower of the church has been converted to hold a glass elevator that carries you straight up and above the rooftops for a magnificent view across the town. This is entertaining and the views are very impressive and we recommend it. 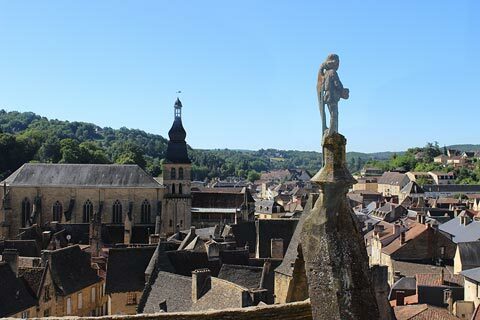 The central location and the very well known attractions of Sarlat mean it is an obligatory stop for everyone visiting the Dordogne. This does mean that it is often very busy, especially on market days in summer, so you might prefer to visit in the morning during summer months. 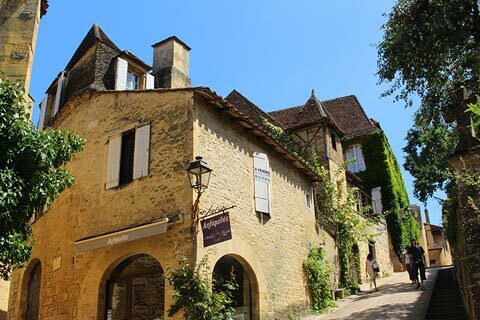 Many of the places in the central Dordogne are easily visited from Sarlat, with medieval castles, beautiful scenery and picturesque riverside villages all close to hand. 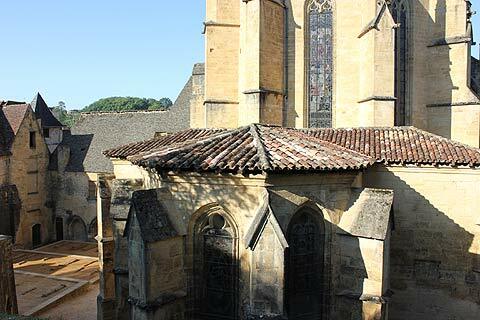 See Dordogne for more information.